Do you suffer from Irritable Desk Syndrome? Is a messy desk hurting your writing productivity? I know that I’m always more prolific, more creative and happier when my desk is tidy. Which isn’t to say that I’m always able to keep it that way. The picture, above, shows exactly what my desk looked like this morning. I fear I might be suffering from Irritable Desk Syndrome. I’ve written before about the advantages of my new standing desk, but today I want to talk about the benefits of keeping a tidy workspace. Did you know that a 2010 study by Brother International found that messy desks and time spent looking for misplaced files, staplers or documents costs corporate America some $177 billion annually. Yes, the word billion is correct. The study also estimated that employees waste an average of 76 hours a year (!) looking for misplaced files, staplers or documents. Take everything off your desk and admire the clear, calming space. Remind yourself it could be like this every day. Commit to the principle that desks are for action, not for storing. Have a large inbox into which you can file (or, more realistically, throw) your papers. From my days working in newspapers, I developed the habit of using a 4-inch-deep wire basket that you can see in the far right of the photo. Have a filing system that’s close at hand and so easy-to-use it makes you want to file. I particularly like colour-coded manila folders. The vibrant colours not only make me happy, they make filing so much easier. Clean your desk at the end of each day. If you’re too tired, do it first thing the next morning. If you do it daily, it shouldn’t take you longer than five minutes. Develop the habit of dusting or wiping down your desk with a cleaning solution (perhaps water, dishsoap and vinegar) once a week. If I do it for five minutes a day I won’t be daunted by the task and the benefits will slowly accumulate. If I don’t wait to be inspired, and just get down to doing the work, then I’ll be able to finish it faster. A clean desk is not the sign of a frightened mind. It’s the sign of someone who hasn’t yet seen the value of tidying. PS: the deadline is fast approaching for the next term of my Get It Done program, aimed at book- and thesis-writers. Only three spots left. If you’re not sure if the program is right for you, email me at daphne (at) publicationcoach (dot) com to book a 15-minute call or Skype session at no charge. 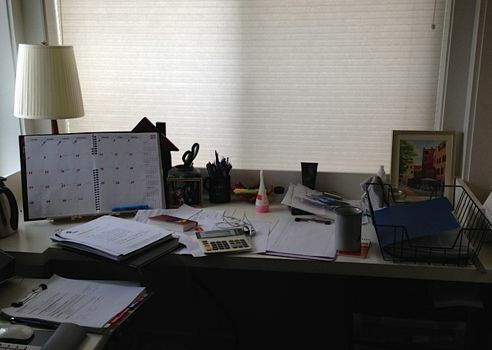 Do you clean your desk before you write? We can all learn from each other so, please, share your thoughts with my readers and me in the “comments” section of my blog. Anyone who comments on today’s post (or any others) by June 30/15 will be put in a draw for a copy of The Subversive Copy Editor by Carol Fisher Saller. Please, scroll down to the comments section, directly underneath the “more from my site” links, below.